Warren Mosler highlighted the ugly trend in the U.S. unemployment rate as measured by Gallup Inc. I am still getting to grips with the R programming language, so I'm not really able to do too much statistical analysis on this right now. In any event, if you wanted to seasonally adjust the data, it would be fairly unreliable (the usual algorithms want 5-7 years history). The structural changes that have resulted from the implosion of the U.S. labour market make those adjustments even harder. But this bears watching, as the magnitude of this divergence appears unusual for mid-year. 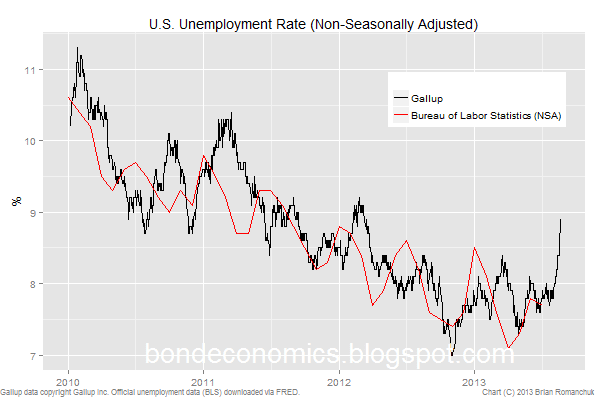 (The seasonal spike in unemployment that occurs after Christmas appears with a lag in the Gallup data, possibly because it is a moving average.) Since the dropping unemployment rate is arguably the most plausible piece of evidence in favour of tightening monetary policy, a reversal of that trend would provide very considerable relief to the embattled bond market.